PPD861D Hot Air Gun Full replace Quick 861DW Rework station. PPD 861D Plus Desoldering Station comes with three nozzles, it is a powerfull mobile phone motherboard repair Hot Air Rework Station PPD 861D. 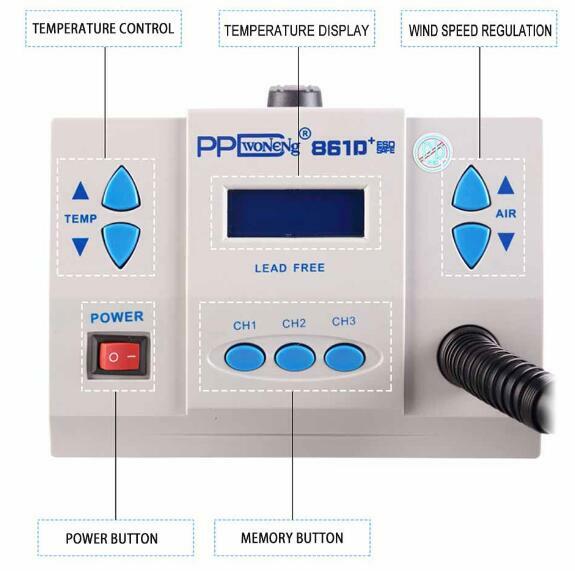 1000W PPD 861D Plus Hot Air Rework Station, the same function with QUICK 861DW, PPD 861D+ comes with three nozzles, 220V and 110V option voltage cell phone motherboard repair. Three regular channels are "CH1", "CH2" and "CH3". Each channel's parameters including temperature and airflow can be set.Password protection and key-lock functions. Real time operation by the magnetic switch. It will enter sleeping state when the handle is placed on holder. Auto sleeping function. Parameters can be set in sleeping state. Closed loop sensor. Temperature can be controlled by zero voltage triggering modes, and adjusted conveniently, accurate and stable, not affected by airflow. An automatic cooling system can prolong the life time of heating element and protect the handle.